The Leonid meteor shower is one of the annual favorites of astronomers. While not as big a show as the Geminids or Perseids, the Leonid meteor shower has a habit of performing better one year than the previous. Refreshed every 33 years by the comet 55P Tempel/Tuttle, the Leonids are expected to put on a good show this year (although Tempel/Tuttle hasn't come around since '96). WHile the shower may be very impressive, it could do so for only a short time. The peak is predicted to occur around 21:30 UTC, with the best action occuring within an hour or two of this peak. Rates are expected to reach up to 300 meteors per hour! So don't miss this meteor shower! When and Where Should I Look? As usual, the best time to observe a meteor shower is during the early morning hours, around 2-5 AM. This is because as the Earth rotates into the sunlight, we are moving into the meteor field. This increases the number of meteors entering our atmosphere over any given location. Of course, not everone wants to stay up that late, so if you don't plan on doing so, start watching for the meteors at local dusk, and they'll really start to pick up towards 11 PM or midnight. To find the direction you should look, simply find the constellation Leo. 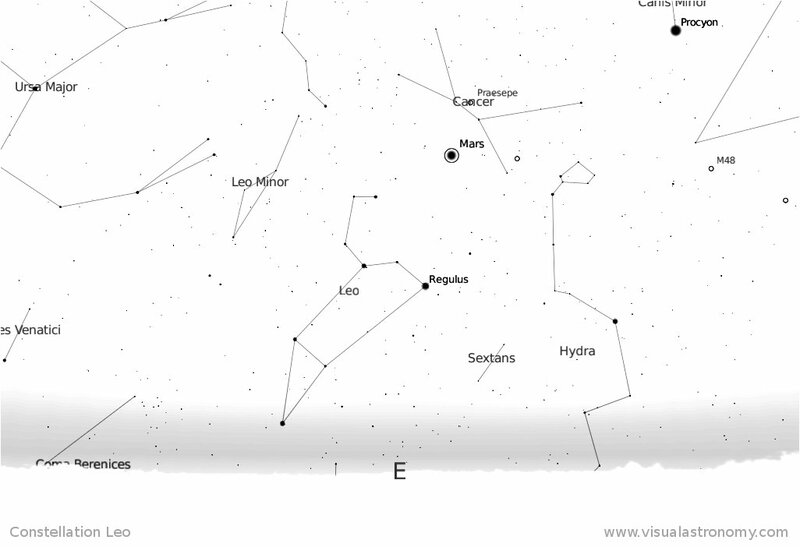 The easiest way to find Leo is to look for the "sickle" shaped asterism in the Eastern sky around dusk. 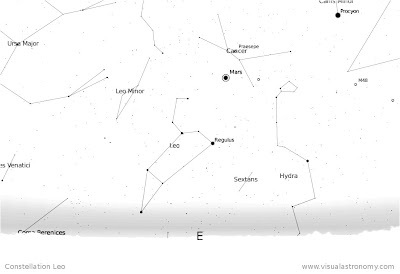 This will be the direction that the meteors will appear to come from. Below is a picture of the constellation Leo. View of Leo at approximately 2:15 AM local time. Note that at times much before 2 AM, you may not be able to see Leo. In this case, look for surrounding constellations. Kudos for your striking ad! That I without doubt savored browsing it all. I may don't forget to lese marke your blog and definitely will in due course give back from now on. I wish to persuade that you choose to keep going an individual's terrific posting, at the same time These days check this Cash Advance Contain a fine daytime! I am really impressed with your writing skills as well as with the layout on your weblog. Is this a paid theme or did you customize it yourself? Either way keep up the excellent quality writing. Thanks!